Great as far as hostels go. Beds were a bit short for me but that's a common problem. Great hostel! Nice and chill but also a good place to meet people. The daily free tours were awesome too. Will come back at the end of my trip, thanks! 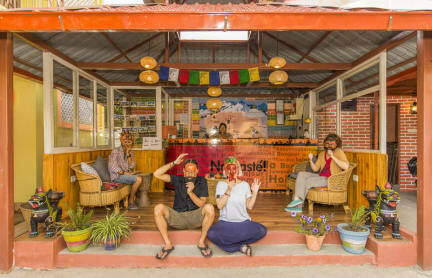 The best Hostel in Kathmandu. The food is great. I mean, it's really great. The place is clean, and they clean room everyday, in every morning. The bathroom inside the room is big and functional: water is clean and hot, and the water jet of the shower is powerfull. In the bar/food zone you can lunch and dinner, and it is also perfect to meet people and for chat. The rooftop is amazing, and the frontman in receptions are very gentle and educated. Definitly the best hostel in Kathmandu. Suggest. 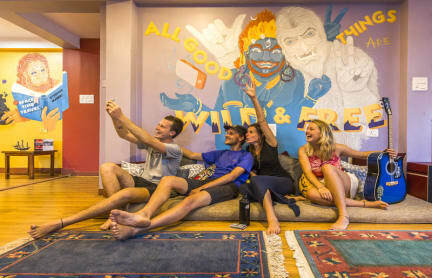 Great hostel for solo travellers, I met people as soon as I arrived in the attached cafe. The hostel runs different activities each day free of charge which were also great! The beds were clean and comfy and the communal space upstairs was lovely. Each room has lockers big enough to fit your whole backpack so the room stayed tidy even with 6 beds. Some rooms noisier than others but either way a great place to start your travels in Nepal. I had a perfectly good time here. Found easy walking distance from everything, with it's own bar and cafe area (perfect for when the Kathmandu food gets too much! ), where you can meet people and hang out. Great base to see the city and then move on around Nepal. Bathroom situation is not good. Evething else is great. Wasn't as great as the reviews raved about. Staff were unhelpful, seating at the restaurant was always crowded and limited, and had to walk around barefoot on a dirty floor.